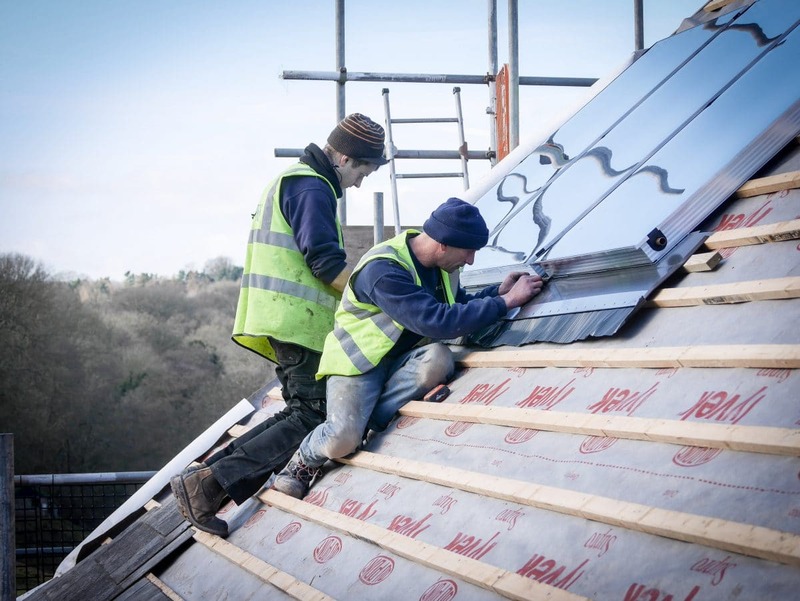 Broadly speaking, there are two key measures when considering sustainable building. The first is to reduce the amount of energy your building uses by ensuring its efficiency is maximised. The second is to seek to limit the amount of carbon you release into the atmosphere through the use of sustainable technologies. For many projects, something as simple as improving the efficiency of the existing boiler is not something that should be dismissed, as this could save considerable amounts of carbon and energy. We also seek to promote simple ideas. A well-sited wood-burning stove, for example, can have a dramatic impact on carbon emissions. We seek to orient your project so the rooms you spend most time in benefit from the warmth of the sun. We have developed a series of simple walling constructions that enable us to double insulate every building we work on. This has a tiny impact on the overall budget, but the lifetime savings on fuel bills and carbon emissions cannot be underestimated. We make careful decisions about the design of the building’s fabric and ensure that building work can be completed to a good standard that does not cut corners that could have hidden energy use implications. We seek to use local trades people, materials and suppliers to ensure that travel distances are kept to a minimum. 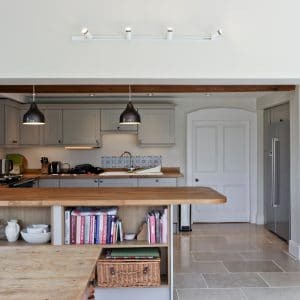 We ensure that the lighting and heating specifications are as efficient as they can be. Because these simple measures are so cost effective, we include them as standard on every project we work on. 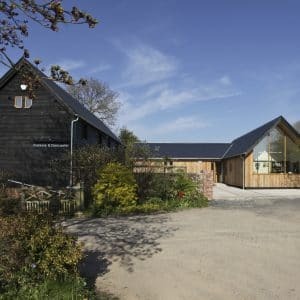 For many of our clients, having a sustainable building is critical to their vision of success and they want to take things further than the simple energy efficiency measures. When that’s the case, there are lots of things we need to take into account to ensure we are creating a building that’s as sustainable as it can be. 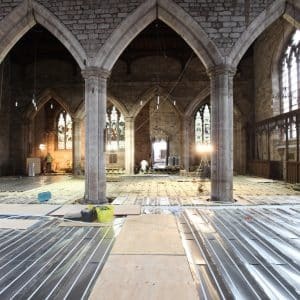 The PCC at St Peter’s Church in Peterchurch wanted the church to be heated sustainably. Because we were working with an ancient building there were quite limited options for minimising heat loss, although we took the task seriously, insulating where we could. 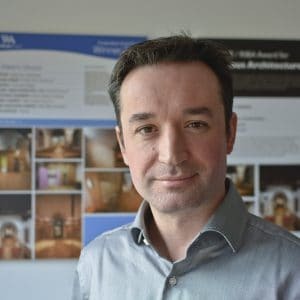 The more important question therefore became about choosing the most justifiable or ethical option for producing a large amount of heat, much of which would leak from the building relatively fast. The solution we chose was two-fold. The first was to use a biomass boiler. There is no denying that it uses a lot of energy, but it is considered ‘carbon neutral’ energy. The project also ensured heat was used more efficiently. 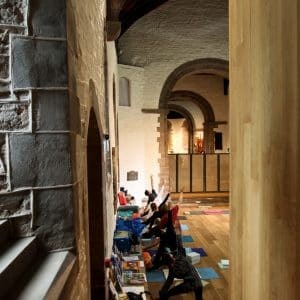 Rather than using oil to heat the building for a small congregation once or twice a week, the church now uses wood pellets to heat a building that is used by lots of people every single day of the week. Therefore the cost of heat per person per use is a fraction of what it was. We have also worked with a client who was instinctively uncomfortable with the idea of felling and shipping trees to heat her home and wanted to use the heat from the sun instead. We used a combination of approaches that allowed her home, which consists of an older existing property and a new extension, to use the sun’s energy and be as sustainable as possible. The new extension is highly insulated to minimise heat loss. A ground source heat pump takes latent heat from the ground to heat the extension, all the property’s hot water and the swimming pool. A solar water collector was installed to provide supplemental heat for the pool while a further measure ensures that heat from the pool is recycled within the pool space. 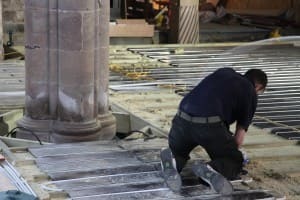 As with St Peter’s Church, there were limited options to minimise heat loss in the existing property, however we made improvements where we could with measures such as insulating the roof. We also installed a small but highly efficient oil boiler to heat the space because it would have been inefficient to use the heat pump in this space. A photovoltaic array provides electricity for both the extension and the existing house. Both properties use highly efficient lighting to minimise electrical consumption. We also used highly thermally efficient windows throughout to minimise heat loss. 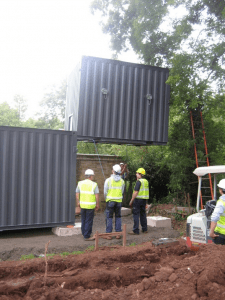 When you would like to consider using low carbon or zero carbon technologies we sometimes advise that a feasibility study is carried out to compare the different technologies available to the site and allow us to choose the options that are the most appropriate. Such a study looks at the technologies from a range of factors that might include capital investment, efficiency, running costs, carbon emissions, payback period and grants available. Without such a study it can be very difficult to compare like with like because each supplier will argue the case for sustainability from their own point of view rather than what may be best for you, your budget or your site. developing the solution that most effectively balances these three criteria. Despite its complexity, we believe that committing to the principle of sustainability and engaging with the issues at stake is an incredibly rewarding process which will, in our opinion, give you a better building.